I don't write about celebrities. I'm a thriller novelist and political blogger. That's not my thing. I refuse to follow them on social media (except for Valerie Perrine and Carl Reiner and a few celebrity authors on Facebook). So when fashion icon Kate Spade hung herself in New York last week, I refrained from writing about it. 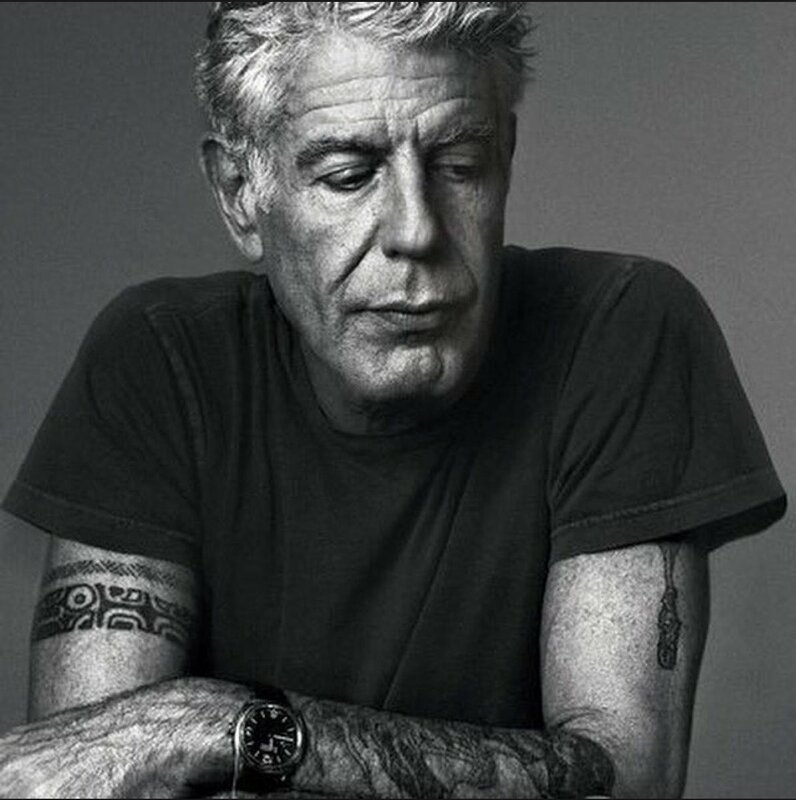 But when I heard on Twitter this morning that Anthony Bourdain had also committed suicide in France, I felt compelled to write about it and his legacy. His sudden and absolutely senseless death hits especially hard in our household. Far from being just a celebrity chef and television personality, Bourdain was also a crime novelist of no mean ability and over the years I'd bought Mrs. JP quite a few of Bourdain's food-based standalone thrillers. In other words, as far as my friendship circle on Facebook goes, he was one of us. I'd watched his shows on the Food and Discovery Channels, although I never got to watch his award-winning show Parts Unknown on CNN. It was a harbinger of things to come. Bourdain's particular brand of hedonism and Swiftian wit brought 120 nations in our living rooms over the years he was on television and made staring non-interactively at other peoples' meals entertaining. He was the fatalistic sort of person who never seemed interested in longevity. He was a smoker although tobacco has been linked to lung cancer. He couldn't get enough red meat ("When Tony comes to town, animals will die," he once said in the Middle East), even though red meat has been linked to prostate cancer. He imported his typical yet unique New York attitude all over the world and, in the process, through our food, the one constant for human existence, he made it a bit smaller. He mercilessly needled his fellow celebrity chefs, especially Emeril and the now-disgraced Mario Batalli with his rapier-like barbs. However, out of all the shows in which Bourdain starred, the one I will remember the most was the one that took place in Lebanon in 2006. Not long after Bourdain and his No Reservations crew had arrived to film another show, Israel had attacked southern Lebanon over the kidnapping of two of its soldiers, effectively killing the episode. Or so they thought. And it's a good thing they did film it- It went on to earn an Emmy nomination. What is clear -- as far as we're concerned -- from all sources is that there is no official, announced plan. No real advice, or information, or public exit strategy or timetable. The news clip of President Bush, chawing open-mouthed on a buttered roll, then grabbing at another while Tony Blair tries to get him to focus on Lebanon -- plays over and over on the TV, crushing our spirits and dampening all hope with every glassy-eyed mouthful. He seems intent on enjoying his food; Lebanon a tiny, annoying blip on an otherwise blank screen. I can't tell you how depressing that innocuous bit of footage is to watch. That one, innocent, momentary preoccupation with a roll has a devastating effect on us that is out of all proportion. We're looking for signs. And this, sadly, is all we have. Tony Bourdain apparently learned long before George W. Bush that food doesn't count for a whole helluva lot while people are senselessly and brutally dying while you have the power to stop or at least mitigate it. He would show his emerging liberal sensibilities again in the season 11 premiere of Parts Unknown when he went to the heart of Trump country, West Virginia, and listened to, if not embraced, the political and social positions of the locals. The food was a mere sidelight. He dimly sensed there was some common, middle ground between his positions and theirs, although he was damned if he knew where and what that was. But in the process, he responded graciously to their hospitality and generosity (although they probably didn't take him seriously because he was a world-famous celebrity chef). And, if not a common meeting place aside from good Appalachian food, Bourdain found the means to respect them, a talent yours truly and many, many of us have yet to find in our own lives. Bourdain's suicide in Paris was senseless and tragic. It brings back the terrible specter of Robin Williams' own suicide and, much more recently, that of handbag designer Kate Spade. And it makes one wonder, if these rich and famous people, with their access to top notch health care, can still succumb to suicidal thoughts, what chance do the rest of us have? Last Sunday, CNN had aired what Bourdain considered to be the cultural highlight of his life. When their director left the show to have emergency surgery, the show was left without a director. After years of reaching out to them, Bourdain had finally obtained the services of director Asia Argento and cinematographer Christopher Doyle, whom Bourdain idolized. He ended his career and life on a cultural high note, making his suicide all the more senseless by conspicuous relief. He also left behind an 11 year-old daughter. Yet, while shocking and needless, it's vastly more important to remember what Bourdain did in his 61 years on this planet rather than to dwell on what he did in his final moments. He made the world fit into a TV screen through the food of six score nations while never forgetting those nations were inhabited by real people with real problems. And his greatest contribution to Mankind was in not eating and cooking long-forgotten meals but in finding the courage to walk in the shoes of others, no matter how much they may have pinched.